Hi Bloggers, Welcome to Bloggers Hangout !!! 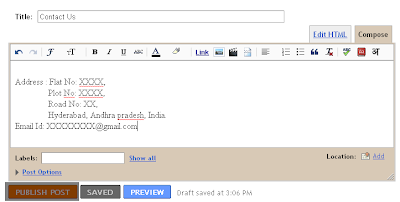 In this Blogger Tutorial, We will look at creating Static Pages in Blogger. Recently, Blogger.com launched Static Pages in Blogger. So, lets see how to add or create Static Pages in Blogger. Step 1: Sign into your Blogger account or( draft.blogger.com). Step 2: Choose the blog for which you want to create static pages from the Blogger dashboard. and provide the page title and also content. Like this, you can add up to 10 stand alone pages such as "Contact Us" or "About Me" or "Our Team". Step 5: Click Publish Page and see the result. If you have any doubts about "Adding Static pages in Blogger" or "Adding Static pages to blog" or "How to Create Static Pages in Blogger" or " How to Add Static Pages to Blogger", please don't hesitate to comment.